Cheating Death Twice poses these questions: what exactly is the Human Mind? Unique in this entire world, yes, but how exactly does it work, what exactly is it made of? Where exactly is it? And the question the author poses is—is your thinking mind actually what the Bible refers to as your spiritual soul? And if it really is a spiritual soul, can it really survive mortal death? What force powers it? Just flesh and blood, or is there some other invisible divine force behind its incredible powers? 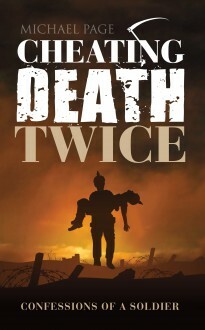 Michael Page, author od Cheating Death Twice confesses to having been born into this life complete with memories of several previous lives. It was after these previous lives that he also remembers being born, literally remembering being squeezed out of his mother’s womb! And if that is not amazing enough, he also truly believes that he can remember being conceived in his mother’s womb. A dramatic out-of-body experience has given the author confirmation that your id, your inner being and your purest spiritual form, can and will survive outside the-body, quite independently, without any body mass.. The author was once a sailor on a Tall Sailing Ship and recalls drowning in the cold sea, and later, in another life, he recalls serving as a Solider in the First World War, and so is able to theorise how, when the time comes, one can cheat Death..